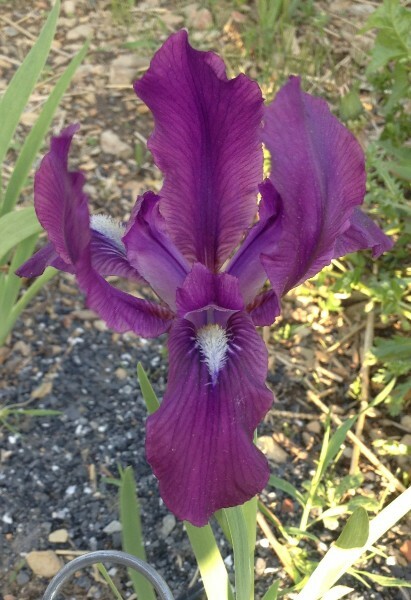 World of Irises: Arilpums: Fertile Arilbred Dwarfs! Most arilbred medians are produced by crossing standard dwarfs (SDBs) with fertile halfbreds (OGB). The results of such crosses tend to be pleasing garden subjects, occupying about the same niche as intermediates (IBs), but with the added interest of arilbred color patterns. Unfortunately, arilbred medians produced this way are usually infertile, or have very limited fertility at best. Also, being only ¼ aril (OGB-), they don’t always show enough pronounced aril characteristics to really stand out as arilbreds. For those of us who enjoy the smaller arilbreds, the holy grail would be diminutive fertile arilbreds that are half aril in content. We might imagine miniaturized versions of the taller arilbreds that have come from breeding arils with tall bearded (TBs). One approach to realizing this dream is through the creation of “arilpums”: hybrids between arils and the tiny dwarf bearded species Iris pumila. This type of cross produces true arilbred dwarfs, around 10-12 inches (25-30 cm) in height, fertile, and half aril. 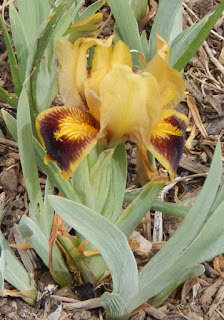 Additionally, Iris pumila is expected to confer winter hardiness on its seedlings. 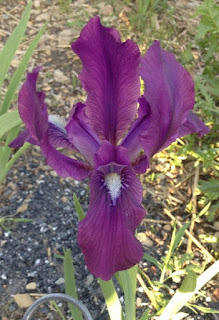 The potential of such breeding was first appreciated in the mid 20th century, when iris breeders became aware of the cytogenetics of irises, and the possibility of creating “fertile families” of irises from wide crosses, if the parents are chosen to have the right chromosome configurations to produce fertile offspring. Both the SDBs (from TBs crossed with Iris pumila) and the fertile arilbreds (from TBs crossed with arils) are examples of such fertile families, and show how varied and successful they can be. The most direct way to build a fertile family of arilpums is to cross Iris pumila with tetraploid arils. In nature, the only tetraploid arils are the Regelia species Iris hoogiana and Iris stolonifera. Indeed, the pioneering hybridizer Paul Cook (who also introduced the first SDBs from TB x pumila crosses) produced two hoogiana/pumila hybrids in the 1950s: ‘Hoogpum Blue’ (Cook, 1956) and ‘Hoogpum Purple’ (Cook, 1956). Both were fertile, but Iris hoogiana doesn’t have many characteristics that most of us think of as epitomizing the “aril look”, and these little offspring were not very distinguishable from MDBs, and in fact were registered as such. The first approach to arilpums with oncocyclus ancestry came from Peter Werckmeister, the great expositor of cytogenetic theory to English-speaking irisarians. In the 1970s, he produced “Miltonia” (not registered) from a lucky cross, in which the aril parent (an oncogelia from ‘Teucros’ x Iris susiana), although a diploid, acted as a tetraploid by producing an unreduced gamete. Werckmeister reported eventually creating a whole array of fertile arilpums from “Miltonia”. Alas, they were not widely distributed and are now lost to us. Interest in arilpums underwent something of a revival in the 1990s, after Samuel Norris and John Holden created a line of tetraploid oncogelias from using colchicine treatment. Crossing these with Iris pumila produced arilpums with much more “onco look” than had been possible previously. The first of these to be introduced was ‘Barbarella’ (Mathes, 1991), followed by ‘Aladdin’s Gem’ (Thoolen, 2002). Both Harald Mathes and Francesca Thoolen raised a number of different arilpum seedlings, but these were the only two registered and introduced into commerce. Both ‘Barbarella’ and ‘Aladdin’s Gem’ produce fertile pollen, but are unwilling pod parents. Mathes and Thoolen noted similar difficulties with their other arilpums, and their breeding programs were eventually abandoned. The lack of pod fertility was an unfortunate setback, because the simplest way to build up this family would be to cross the existing arilpums among themselves, rather than repeating the initial aril x pumila crosses. The most recent arilpum is the lovely stolonifera/pumila hybrid ‘Topaz Talisman’ (Jensen, 2015). It has not yet been tested extensively for pod fertility. Why has this family not made more progress? It has been more half a century since its potential was first understood, theoretically. I do not believe the pod fertility issue is insurmountable, although it is a setback and perhaps kept the family from taking off in the 1990s, when interest was greatest. Since then, the number of hybridizers working with arilbreds has declined, and not all are interested in such an experimental project. The parent plants, tetraploid arils and Iris pumila, are not easy to grow in all locations: the arils need a very dry summer, and pumila needs a cold winter. Another obstacle is that the initial crosses are difficult, not many viable seeds are produced, germination is poor, and so a lot of persistence is needed to bring arilpum seedlings to bloom. Since I began working in this area six years ago, I have made 365 pollinations, resulting in 525 seeds, and at long last four seedlings which I hope to see bloom this year or next. 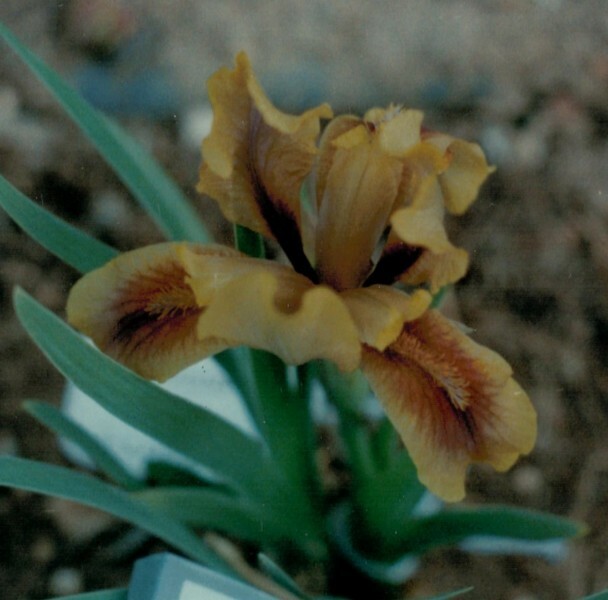 Acquire tetraploid arils, such as Iris stolonifera, ‘Tadzhiki Bandit’, ‘Tadzhiki Eclipse’, ‘Werckmeister’s Beauty’, ‘Balalaika Music’, and ‘Dunshanbe’. Keep in mind that you must use tetraploid arils – crossing Iris pumila with random arils and arilbreds offers no special hope of fertility in the seedlings. 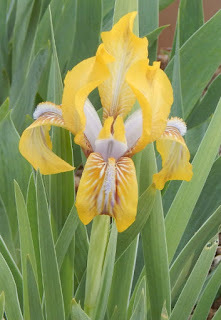 Acquire Iris pumila, either from seed exchanges, or named cultivars such as ‘Royal Wonder’, ‘Wild Whispers’, ‘Little Drummer Boy’, ‘Hobbit’, and others. Make crosses between these two groups, as often as possible, and mixing and matching parents as much as possible. Also get any available arilpums (pretty much just ‘Aladdin’s Gem’ and ‘Topaz Talisman’ these days), to cross amongst themselves or with arilpum seedlings you produced from the aril/pumila crosses. I think this a project that offers enormous potential in the long term, and is ideal for a small, backyard hybridizer who does not have the resources to grow thousands of seedlings and does not need to worry about immediate commercial success. There is a whole new world waiting to be opened up!